One of my favorite kitchen gadgets (besides my amazing food processor) is my slow cooker…a.k.a Madame Crockpot. My mom bought Madame Crockpot for me when I left for college *cough* many moons ago. Madame has been my constant companion through many tough seasons. Madame Crockpot has saved me numerous times and has always provided a nutritious and hot meal when I came home from a long day of studying, or working, or camping, or skiing, or fishing, or running, or lounging around watching Last of the Mohicans on a rainy day. If only she fit in my pocket! I would take her everywhere!!!! Lately I have been studying and studying and studying every chance I get. So, as always, Madame Crockpot came to the rescue this past weekend and made me an amaaaazing beef stew. 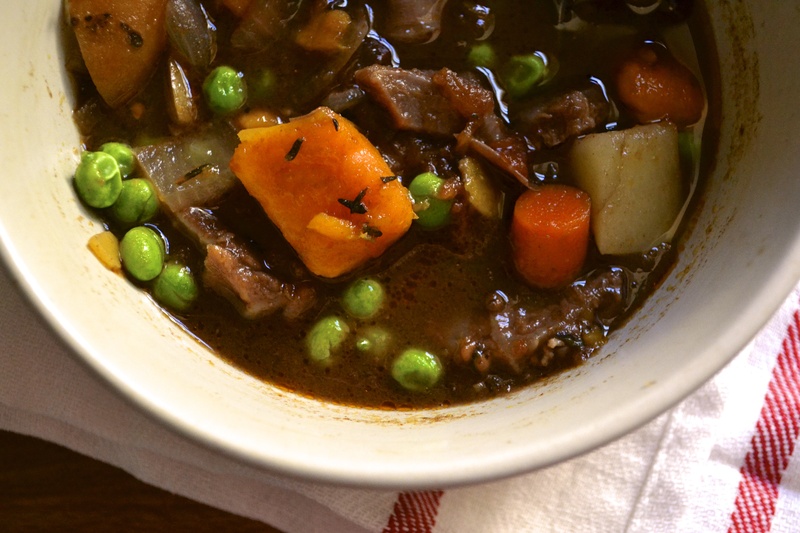 The beauty of stew is that it is really hard to screw it up. It’s quite a simple recipe…. (1) brothy substance, (2) veggies, (3) herbs, (4) toss in meat if you want, and (5) cook it low and slow. So feel free to swap some things out for what you have on hand. I think mushrooms would be a fabulous addition or even butternut squash. Add diced beef to slow cooker. Place vegetables in order as they appear above (onions through sweet potatoes). Pour canned tomatoes with juice on top. Mix beef broth, tomato paste, balsamic vinegar, and herbs together in a bowl. Pour on top of vegetables in crock pot. Put lid on crock pot and cook on low for 10 to 12 hours or on high for 4 to 6 hours. Add peas during last 15 minutes of cook time. Season with salt and pepper. 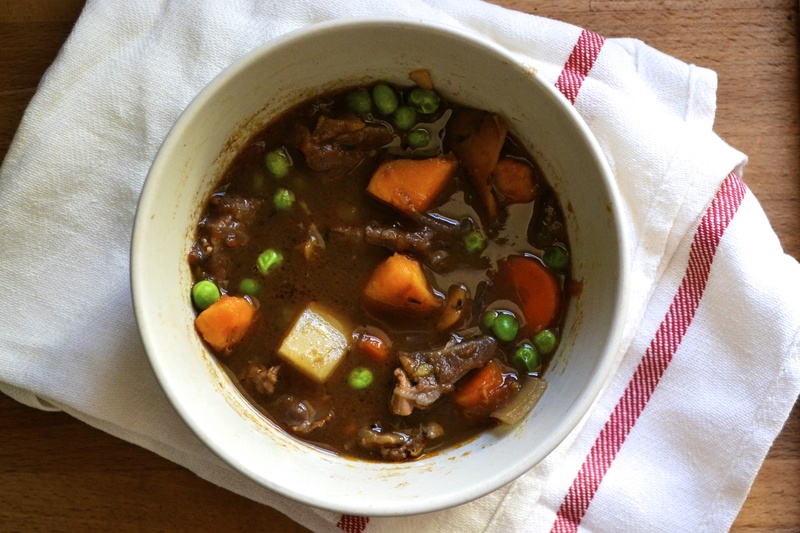 This is exactly the kind of stew I am planning to make for Halloween. However, basalmic vinegar is not in the ingredient list but it is in the instructions. How much balsalmic? Oh thanks for catching that. I added 1 tablespoon of balsamic to the recipe for a deeper flavor for the broth and the acid helps tenderize the meat. If you dont have any, I think the soup would be fine without it too. Oh yum. I love stew and chili! I bet those tomatoes really tasted great paired with the sweet potatoes. Thank you so much for the comments. I love knowing that you really enjoyed the recipe as much as I did!